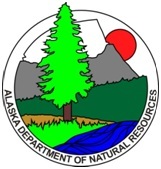 Difference between revisions of "Alaska Department of Natural Resources"
Alaska Department of Natural Resources is an organization based in Anchorage, Alaska: Energy Resources. DO&G develops and manages the state's oil and gas leasing programs. The Oil & Gas division staff identifies prospective lease areas; performs geologic, economic, environmental and social analyses, develops a five-year leasing schedule, and conducts public review of proposed sales. The division conducts competitive oil and gas lease sales and monitors collection of all funds resulting from its programs. It is also responsible for the development of the state's geothermal and coalbed methane resources. ML&W is the primary manager of Alaska's land holdings. Responsibilities include ensuring the state's title; preparing land-use plans and easement atlases; classifying land; leasing and permitting state land for recreation, commercial and industrial uses and coordinating and overseeing the needed authorizations for major development on the North Slope. It also manages 2.5 million acres in Public Use and Recreational River Systems and is responsible for land sales and conveyances to municipalities. The division also manages mineral (excluding oil & gas, coalbed methane and geothermal energy) and water resources. It manages state mineral exploration, development and leasing programs on the 96 million acres of state lands available for mineral exploration and mining and administers state's Surface Coal Mining control and Reclamation Program. The division allocates and manages the state's water resources on all lands in Alaska, adjudicates water rights, provides technical hydrologic support, and assures dam safety. The DGGS generates, analyzes and interprets data on geologic resources and natural conditions; maps and inventories mineral and energy resources on state land for use by government, private industry, scientists, educators and the public. The Commissioner's Office oversees the DNR divisions and a number of offices, including: the State Pipeline Coordinator's Office, part of a joint federal-state program to oversee the 800-mile Trans-Alaska and other common-carrier pipelines; the Mental Health Trust Land Office, that manages the Mental Health Trust's land and resources assets; the Office of Project Management & Permitting, which coordinates the review of larger scale projects in the state; the Alaska Gas Pipeline Project Office, which monitors efforts to develop a pipeline to commercialize the North Slope's natural gas supplies; and the Public Information Center, which offers "one-stop shopping" for the department's programs and services. ↑ "DNR Divisions and Offices"